The results of our crowdsourcing project, in collaboration with the Project for Public Spaces, reveal not an objective Top 100 but instead a handful of communities passionate about their own local public spaces. Not the sort of city you'd expect to find in the number 1 spot on a list of the Top 100 Public Spaces in the U.S. and Canada. 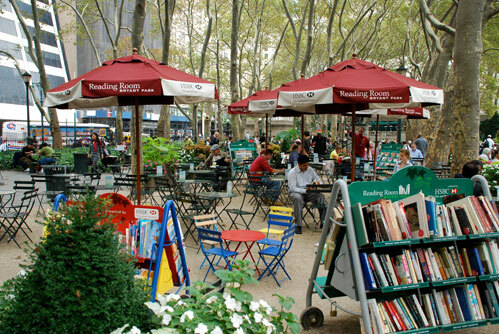 But Mayor Chris Koos of Normal says that while beating New York's Central Park and Philadelphia's Rittenhouse Square is unexpected, "I do believe the Circle as a Public Space stands on its own as a truly unique, inviting and innovative space." Passion was the rule of the day for our Top 100 Public Spaces survey project. From the beginning of our crowdsourcing project, it became clear that rather than an impartial list of the most revered, tested and acclaimed public spaces in the U.S. and Canada the results would reflect an impartiality. The residents of New Hope, Minnesota (#22 on our list) rallied to let the world know about their Community Farmers Market, "our "front porch" where we take a moment to chat with our neighbors, enjoy life's simple pleasures, and eat food," says their website. 1. The Circle in Uptown Normal, IL. The Circle is a multi-functional public space located in a roundabout that provides community green space, re-circulates storm water into a public fountain and improves traffic circulation. 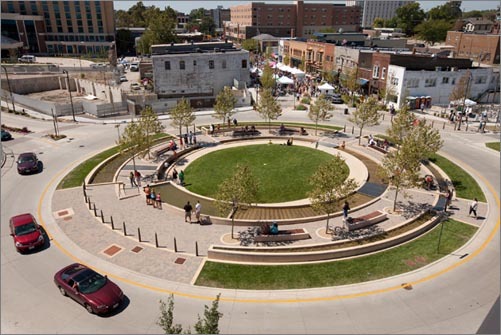 Designed by Hoerr Schaudt landscape architects, the circle creates an energy that draws people together. Located next to the Children's Discovery Museum, bustling Amtrak station and planned multi-modal transportation center and within walking distance of Illinois State University, the circle creates a micro-community of travelers, patrons, students, professors, families and children as they gather and congregate on their daily journeys. During the day, the circle is vibrant and alive with children playing in the grassy areas, visitors coming for a place to sit and enjoy an ice cream or friendly picnic back dropped by the charming tree lined streets home to local businesses and shops. It is also the location of many community events, including the annual Sugar Creek Arts and Sweet Corn Blues Festivals, and a farmers market. Temple Plaza, with art by Felice Varini. Located in the heart of downtown New Haven, CT, Temple Plaza was created in the 1990s by hollowing out the crumbling interior of a large city block. Small and irregularly-shaped, it is bordered by utilitarian concrete structures, metal fire stairs and walkways, brick walls, concrete columns and a dramatic corkscrew exit ramp from the parking garage. Tightly enclosed and with vistas obstructed by long, narrow passageways, the plaza contains outdoor cafes, stairs to perch on, fountains, cascading steps, and a small lawn for picnics or a lunchtime nap. The dramatic sculptural presence of the curving concrete ramp of the parking garage inspired Swiss artist Felice Varini, whose 'Square with four circles' installation opened in Temple Plaza in June, 2010. This 110 ft tall, 280 ft long wall painting uses the concrete exit ramp of the Crown Street Garage and the walls of the buildings along a pedestrian passageway as a canvas. The artwork presents both a dynamic and a static experience of Temple Plaza. Free, open 24/7 and accessible, the artwork is estimated to have attracted more than 100,000 visitors to the site, the installation has brought a new kind of visual excitement to New Haven's downtown. Campus Martius Park. PHOTO: PPS. 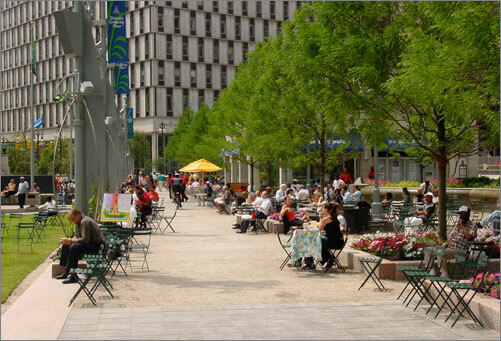 Because of a revitalized Campus Martius, people are coming back to downtown Detroit -- to hear concerts, watch outdoor movies, admire the ever-changing flower gardens, delight in the fountains, meet a date at the Park Cafe, or simply sit and relax. A key accomplishment of Campus Martius has been its ability to attract visitors of all kinds. "We've been surprised by how many people from the suburbs are coming here," notes Bob Gregory of Detroit 300, the management entity responsible for the park. "The quality of the space attracts everyone from rich to poor. The programs are all family-oriented. One of the measures of a good place, according to Project for Public Spaces, is if you see women and kids using it. Well, that happens in Campus Martius. Everyone is there." Campus Martius is located in the center of Detroit's Central Business District, a roughly one-mile-square area framed by three major roads and the Detroit River. It contains grassy lawns, gravel walkways, and informal seating for more than 2,000 people on walls, benches, steps, and movable chairs. Two retractable stages with light and sound equipment can be moved into position for events. An ice skating rink fills much of the park from November to March. An Au Bon Pain offers café food year-round, with both inside and outside seating, and wireless Internet is available throughout the park. Pétanque and bocce ball courts provide active uses; a central fountain with water walls and the restored Soldiers and Sailors Monument add their own flavors. The space is designed to maximize the number and types of activities that can take place, and is sufficiently flexible to allow changes to and evolution of the space. Cal Anderson Park. Photo: dalylab. 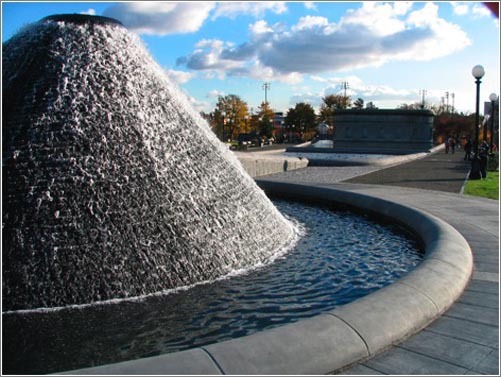 When a state mandate required drinking water reservoirs to be covered, Seattle took the opportunity to make its Lincoln Reservoir roof double as park space. A groundswell of support to honor a local role model, the late congressman Cal Anderson, succeeded in transforming the Olmsted Brothers-designed Historic Lincoln Park into our 4th most popular public space. The result, says Peter Harnik of the Trust for Public Land, was "beautiful parkland." The recently redesigned space, in Seattle's Capitol Hill neighborhood, includes paths, texture pools and playing fields. "The biggest surprise is the breathtaking sense of space from within the park, which makes it seem much larger than it really is," explains Kay Hood, who organized much of the community activism that lead to the redesign. "The biggest gratification is that the variety of uses is as wide as the variety of people, and with that, a new balance of enjoyment and respect for one another, and for this place, has been achieved." Sculptures from Mankato's 2011 CityArt Walking Sculpture Tour. PHOTO: CityArt Mankato. Not unlike the more au courant practice of tactical urbanism, art fairs and competitions are enlivening spaces across the U.S., most notably in Grand Rapids, Michigan. 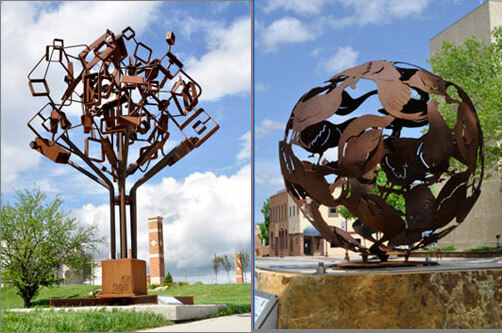 Mankato, Minnesota's CityArt Walking Sculpture tour is cultivating a lively and active street life in the city center. This project has been warmly received for its improvement to sidewalk aesthetics and highly regarded for its ability to attract visitors to shops and restaurants on or near the tours path. Launched in the Spring of 2011, twenty-five sculptures by artists from around the world are arranged on pedestals and are displayed for a full year. Maps and ballots along the 6-block route and the public is encouraged to vote for their favorite. The winner is purchased and placed in the public art collection of the City Center. Since its restoration in the 1980s, Bryant Park – originally built 100 years earlier - – has become one of the best "new" urban parks in the world. Its overall design and elements support a range of activities and uses for people who work, shop, or live nearby, as well as those who are just visiting. Located in the heart of midtown Manhattan, adjacent to the New York Public Library main branch and dozens of high-rise corporate offices and headquarters, the quiet lawns and tree-lined paths provide a critical respite from the buzz, stress and energy of the city. The park's center is a three-acre open green surrounded by tall, arching trees. Kiosks at its northwest corner offer coffee and light meals. More than 1,000 lightweight chairs can be moved throughout the park during good weather; visitors can rent pieces for chess and backgammon tables from the New York Chess and Backgammon Club. Other attractions include flower gardens, a fountain at the west end of the park, ping-pong, and a variety of vantage points from which to just sit and watch the world go by. In the winter, ice skating takes over the lawn area; the rink is popular with tourists and New Yorkers. Pittsburgh Market Square. PHOTO: PPS. 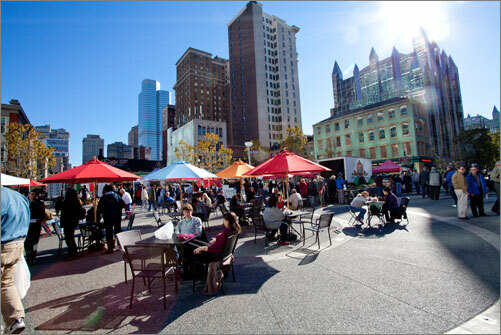 Market Square is a unique space in the heart of downtown Pittsburgh with a storied past. It's been the central square in Pittsburgh's downtown since the 18th century, and was the site of a public space known as the Diamond, or Diamond Square, that was demolished in 1962. To keep the historic scale and style of the downtown intact, Market Square was designated as Pittsburgh's first historic district in 1972. Several redesign projects followed suit. Given its history and central location, the place should have been an active, sociable destination, but even after several redesigns, the square floundered as the central area in downtown. In more recent decades, the square was characterized by drug use, heavy bus traffic and loitering, and especially after 5 p.m., dreary emptiness. The refurbished 68,000 square foot plaza combines the four quadrants of the old square into one large pedestrian-only center island. Raised curbs and planters were eliminated and the square re-graded to one, consistent plane. The red brick paving and withering plants were replaced by modern paving material and a lighter-colored large circular ring that draws visitors to the center of the square. The new trees were planted in four organized clusters, nodding to the historical street patterns and the previous four quadrants. Temporary seating and bistro tables are also spread out through the plaza. In addition to seating in the square itself, new brick sidewalks were extended on the streets around the square, allowing for expanded café seating. Arts District at Bay Street. PHOTO: PPS. Bellingham's downtown Arts District spans the area between the civic center to the north and commercial core to the south, and also connects to the Old Town district and the Bellingham Bay waterfront. 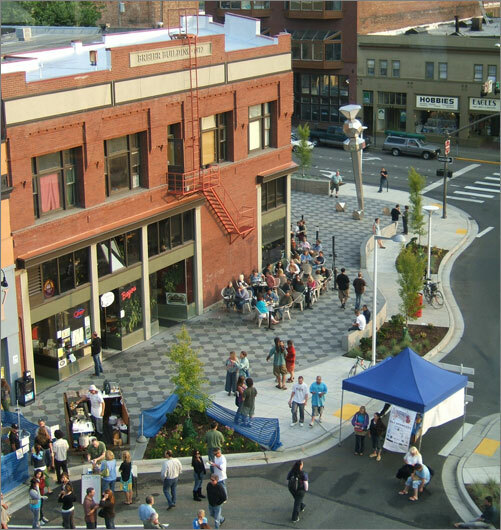 The city of Bellingham has done a number of streetscape improvements to make the district more walkable and community-oriented -- including the removal of high-volume parking and newly widened sidewalks for a safer, more pleasant pedestrian experience. Restaurants and retailers have been encouraged to spill out onto the sidewalks, and the addition of benches and plantings makes the streetscape attractive and functional. Public plazas are being created at the Art & Children's Museum, the library, and key intersections in the downtown district, linking cultural institutions to the cityscape and promoting multi-use community gathering places. Revitalization in and around Maritime Heritage Park, including cleanups, landscaping, and increased attention to local activities and parking, have already made the park a safer, more effective community destination. Balboa Park is one of the city's most prized attractions, beloved by both residents and visitors. The 1,200-acre park, opened in 1868, is organized around a system of internal paths leading to its cultural attractions. It is home to one of the best collections of Spanish Colonial Revival architecture in the United States, legacy of the city's decision to host a Panama-California Exposition in 1915. 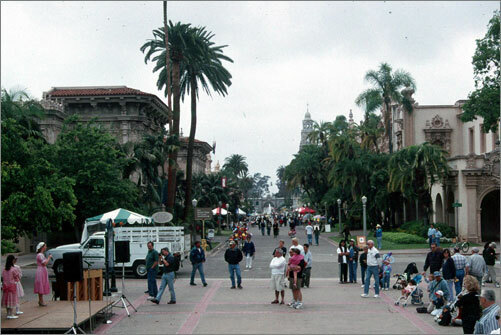 Balboa Park draws 10-14 million visitors annually and attracts a diverse group of users. The edges of the park are well-integrated into the surrounding neighborhoods, attracting a large number of locals, and the amazing cultural, conservation, and recreation organizations within its boundaries draw visitors from all over the world. The lively atmosphere and flexibility of recreational space allow for numerous activities to take place, including weddings, festivals, performances, painting, and parades. 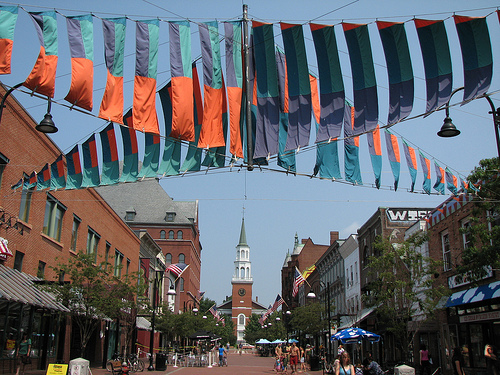 Church Street Marketplace District. PHOTO: origamidon. Historic Church Street Marketplace is part of a National Register Historic District, with Victorian and Art Deco structures as well as modern infill buildings. It was built in 1981 with the involvement of forward-thinking planners who saw a need for a strong city center for a strong identity. Building heights are restricted to preserve the appearance of historic structures and maintain great views of Lake Champlain, the Adirondack Mountains and the First Unitarian Universalist Society church with its clock tower steeple built in 1816. Zoning promotes ground floor retail and upper-story office and residential uses. The Marketplace, with fountains, public art, street entertainers and vendor carts, is a central gathering place for festivals such as the Magic Hat Mardi Gras parade in February, and the Discover Jazz Festival in summer. During the holiday season, more than 200,000 white lights illuminate the four-block-long, bricked mall. The Marketplace attracts nearly three million visitors a year. 80 Meridian Hill Park Washington, D.C.